The web browser on Kindle Fire introduces a radical new paradigm -- a "split browser" architecture that accelerates the power of the mobile device hardware by using the computing speed and power of the Amazon Web Services Cloud. 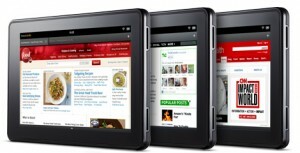 The result is a faster web browsing experience, and it's available exclusively on Kindle Fire. One of the headline features of Amazon's new Kindle Fire tablet is a completely new Web browser called Silk that is designed with a "split" architecture, allowing it to offload much of the heavy lifting to Amazon's cloud computing cluster for superior browsing performance. When the user requests a webpage in Silk, the request will be routed to Amazon's servers in the cloud. Amazon will load the webpage on the server side, downloading all of the necessary content elements in parallel. After downloading the content, Amazon will send the compiled page — including HTML, JavaSript, CSS, and images — back to the device as a single stream of data. The Kindle Fire comes with a new browser call Amazon Silk. The Silk browser splits resources between the device and Amazon's EC2 cloud servers to render pages faster and smoother. The EC2 cloud servers will do the heavy processing power for most of the sites you will visit and will cache the content for you for quick load times and save power on the Kindle Fire. Other browsers have tried something similar to this like Skyfire but not with the power that Amazon's servers have. Watch the video below as it will give you a better idea of how Amazon Silk works and cuts page loading times in half. Makes you wonder if they will make a desktop version and/or offer this on other mobile OS platforms and join a very crowded browser market.